Alabama grape farmers will find that the state is well-suited for grape production because of its high elevation and mild winters. This fact contributes to the successful operation of 10 different wineries throughout the state. Most of these are located near Birmingham in central Alabama. At these wineries, guests can enjoy a bottle of wine made with grapes from these local farms, or purchase jellies, jams, juice and, and even starts of grapevines for their own gardens. Locate an area in full sun that is at least 75 feet from outlying wooded areas, especially in the northern part of Alabama. 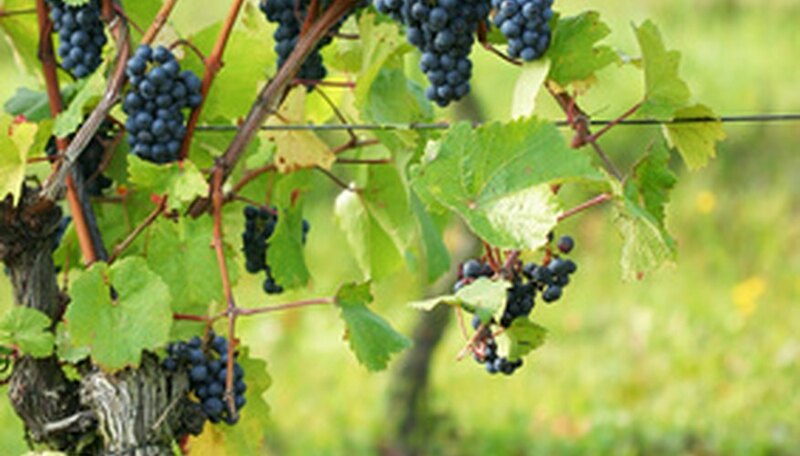 Keep your grapevines at least 50 feet from sloping hills that are more than 10 feet high. Inspect the area intended for your grapevines shortly after a heavy rain to make sure there are no patches of standing water. Ensure that the ground is not heavily soaked or swampy. Have your county extension office perform a soil test. Make sure that the pH of the soil is between 6.5 to 7.0 by adding dolomitic lime in the amount recommended by the soil test and tilling with a garden tiller. Plow the area where you wish to grow grapes by using a tractor and plow attachment to a depth of 8 to 10 inches. Remove the plow attachment from the tractor and install a disk attachment, which will break up the soil. Drive the disk over the newly plowed area at least two times. Mark grapevine rows with a long steel tape measure. Keep the rows to less than 200 feet in length with 20 to 30 feet between rows. Use wooden stakes to mark the ends of each row and the location of supporting posts, which should be located approximately every 12 feet. Dig a hole 3 to 4 feet deep and 2 feet wide for each post. Place a post that is 3 to 5 feet wide and 10 to 12 feet tall on each end. Fill in the hole with dirt. Place a post that is 2 to 3 feet wide and 10 to 12 feet tall in each supporting post hole. Cover the holes with dirt. Attach top posts that are 12 feet long and 6 to 8 inches wide to the supporting posts with a hammer and nail. Drive a 2- to 3-inch nail directly through the beam to attach it to the post. Choose a variety that is known to be resistant to Pierce's disease, especially if you are south of Birmingham. Select white grape varieties, such as Blanc Du Bouis, Suwanee or Lake Emerald if you wish to grow white grapes. Choose Blue Lake or Miss Blue if you are planning to grow blue grapes. Dig a hole 8 to 10 inches deep and 6 inches wide next to each end post with a post-hole digger. Pour one gallon of water in each hole with a bucket. Place the plant into the hole so that it is 1 or 2 inches deeper than it was planted at the nursery. Spread the root system out inside the hole as much as possible. Cover the hole with dirt. Prune off the new plant to a single stem. Take a small piece of twine and tie the new grapevine stem loosely to the supporting post.